A period of depression... Misato, still despondant over the death of Kaji, now finds herself locked in her room, listening to Kaji's final telephone message over and over again. Asuka, her confidence shattered by her inability to synchronise with EVA-02, is hiding at Hikari's apartment, playing video games. Ritsuko is informed that her cat, which she had left in the care of her grandmother, had died. Later, after being questioned by SEELE, Ritsuko decides to show Shinji the truth about Rei, and the terrible secret behind the dummy plugs. It's taken twenty-some episodes, but the nature of Rei's existence has finally been confirmed. Of course, this has been going on for so long, and enough hints had been dropped along the way, that this came as no surprise at all. Neither was revelation about the source of the dummy plugs. As commented in earlier reviews, Shinji is either the most naive (is 'stupid' a better word?) person to have survived Darwinian theory, or the writers just don't give the audience enough credit. Or perhaps there's a more basic reason for spreading the material out so thin: could it be that they had to stretch the material over the entire 26 episode run, and simply couldn't afford to hire the writers to make up sufficient filler material? Animation quality continues to take quite a bit of a hit -- lots of repeated overlay scenes, and scenes of minimal detailing. As might be expected, a series of any length would build up quite a library of re-useable stock footage. But surely they could have shown Rei's bandaged character a little differently than from the first few episodes of the series. (Or are they implying that she had to undergo the exact same reconstruction as in the first incidents?) We often see this technique used to cut costs, but there are time when you can get away with it -- such as the various launches of the EVA units, and other times when you simply cannot. Perhaps what I found most disappointing of all was Yamaguchi Yuriko's (Ritsuko) acting abilities... or more correctly, lack of it. While she pulls off the detached, professional persona extremely well, while her broken, sobbing character was a classic (and painful) example of over-acting. 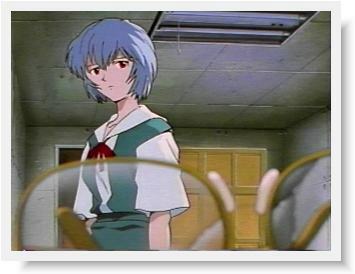 Still, there are two things that make this series worth watching: above average direction, and a strangely captivating character in the form of Ayanami Rei, skillfully portrayed by Hayashibara Megumi. In episode 23, a word is spray-painted on the back of Rei's underground room. What is the word, and what is its significance?